On Thursday, March 7, the All-Party Parliamentary Group (APPG) on Women, Peace and Security, GAPS UK, and the network of Women Mediators across the Commonwealth (WMC) held “Women Mediators across the Commonwealth: Experiences and Stories of Women Mediators from Around the Globe” at the UK House of Lords. Chaired by Baroness Margaret Prosser OBE, Vice Chair of the APPG on Women, Peace and Security, the discussion brought together members of the network of Women Mediators across the Commonwealth (WMC). Sanam Naraghi Anderlini, Executive Director of ICAN, and Mossarat Qadeem, WASL partner and Co-Founder of PAIMAN Alumni Trust, were joined by Magda Zenon, Women, Peace and Security activist and broadcaster, and Elizabeth Solomon, Executive Director of the Dispute Resolution Centre of Trinidad and Tobago. The women discussed the importance of recognizing women’s contributions to conflict mediation at the grassroots and other levels, and why it is necessary to include women in decision-making. In addition, they shared their experiences in working for sustainable peace processes. On Friday, March 8, ICAN participated in a breakfast seminar hosted by the Norwegian Embassy in London. The Norwegian Minister of Defence, Mr. Frank Jensen, presented the Kingdom of Norway’s National Action Plan on Women, Peace and Security, published in January 2019. Ms. Naraghi Anderlini represented ICAN and spoke on specific areas within the WPS agenda. 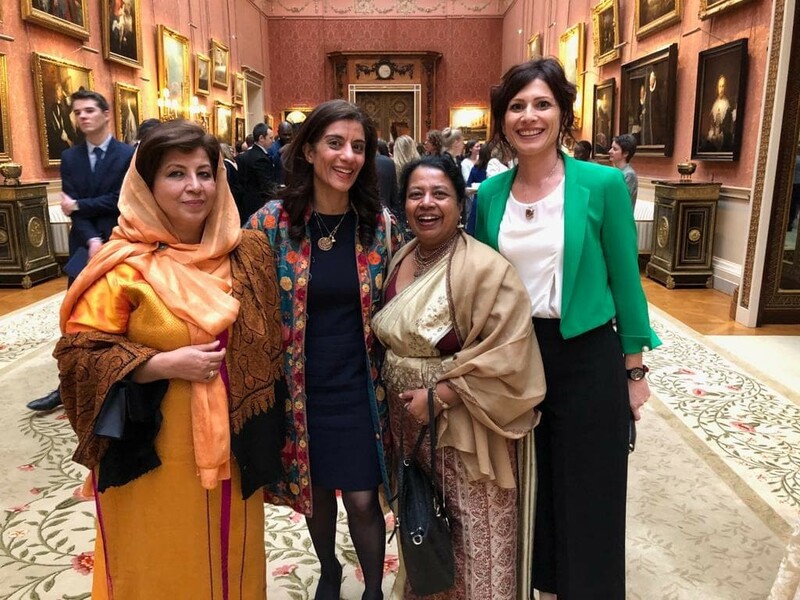 Sanam Naraghi Anderlini, Mossarat Qadeem, and Visaka Dharmadasa, WASL partner and founder of Association of War Affected Women, ended International Women’s Day at a reception hosted by HRH the Countess of Wessex at Buckingham Palace. 200 guests including women peacebuilders from around the world, civil society and UN agencies attended the event where they heard from The Countess of Wessex and Lord Ahmad, the Prime Minister’s Special Representative on Preventing Sexual Violence in Conflict. Ms Dharmadasa also explained the importance of including women in peacebuilding efforts. She played a major role in brokering the ceasefire between the Sri Lankan government and the Liberation Tigers of Tamil Eelam. Through networks such as WASL, Women Waging Peace, and Women Mediators across the Commonwealth, Ms Dharmadasa was able to share the expertise she gained from this experience with women around the globe working at the grassroots level on peacebuilding, conflict transformation and prevention, and post-conflict reconciliation. “With deep commitment and hard work, women can will change the world. I would like to call upon the governments and donors to increase their support to women peacebuilders. Let’s work together in making this world a better place for us and our children to live,” said Visaka Dharmadasa.